It's something that doesn't happen often, the alignment of the sun, earth and moon where the earth blocks the sun thereby denying the moon of light is what's called TOTAL LUNAR ECLIPSE. Such occurrence was observed June 15,2011. In the Philippines, Australia and Western Asia, the eclipse was visible just before sunrise,categorically June 16, Thursday. It was all over tv and internet the day before but the eclipse was not visible until 2:30am PT. I was already fast asleep that time.hahaha. Okay, to be honest, I woke up at 4:30am and I still got to see it, low in the horizon, almost touching the hills west of our village. If I didn't look hard enough, I wouldn't have noticed it.But I was too lazy to bring my camera out. After all, it was too dim I was not even sure I will be able to capture it. Yeah, the moon turned red. Pretty scary right? The explanation, it turned dark at first when the earth directly blocked the sun and later on, a small amount of light indirectly reached its surface. Add that to the effect of the particles in the earths atmosphere, then you had a reddish moon. Nature works wonders!!!! Despite my laziness, I am lucky enough to be friends with photographers. Rex and Jan of Young Photographers Club of the Philippines provided me with the amazing shots above. 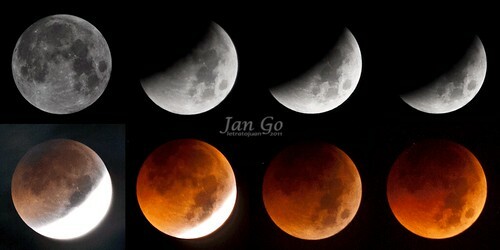 That's how the FULL LUNAR ECLIPSE of June 15, 2011 looked like in the Philippines. Thank you for the information. I stayed up all night and got some photos of the lunar eclipse. I don't have a telescope, but I do have a digital camera with 18 optical zoom. thanks for sharing this is very informative! nagising ako nung madaling araw pero tamad na tamad na ilabas ang camera. 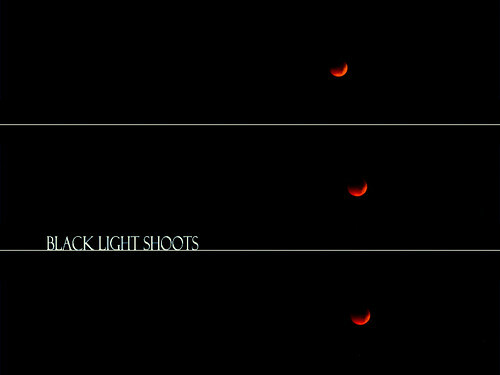 I also saw it live in the night sky after coming work @315H... Its beholding and quite scary because it was reddish. wow it's cool! i think i better be ready for the 2018 one! Salamat po. I had hoped that the photos would be a bit better quality. Maybe I will be able to get the settings better next time. I still have some HD footage to upload. Can I feature the photos on my website (http://theskyabove22.wordpress.com)? I am collecting total lunar images taken by fellow astronomy enthusiasts and photographers.